Making the Grade has been designed to work with School Loop and it works best with the latest version. Both assignments and rosters flow from School Loop into Making the Grade. You do not need to enter assignments or manage rosters in Making The Grade. Be sure to follow the steps outlined in the Partner Gradebooks page to switch from the School Loop Gradebook to Making the Grade. Note: Do not activate the Spanish language features in Making the Grade. Doing so will prevent progress reports from uploading to School Loop. On the portal page in School Loop, select Partner Gradebook in the Gradebooks menu on the Navigation Bar. Select Export Rosters and Assignments to Making the Grade on the Making the Grade Tools page. Click Download Roster and save this file (it will have a .gbx extension) in a folder created for depositing Making the Grade files. Note: Do not import from the File menu. Do not enter student names or IDs manually in Making the Grade. Log in to Making the Grade. Choose Import School Loop Rosters. Find the desired roster file and open it. It will automatically be converted into a Making the Grade file for a teacher's first course. Click Save. Users will be prompted to do a one-time setup of your gradebook. All School Loop categories will be automatically entered in Making the Grade. Now users are ready to enter grades in Making the Grade. Teachers can add assignments and new students to an existing gradebook on a regular basis by simply downloading rosters and assignments in School Loop and importing them in Making the Grade. Once the updated rosters have been downloaded, open your Making the Grade gradebook and select Update Rosters from the School Loop menu. 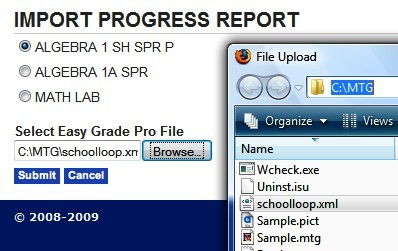 Once grades have been entered in Making the Grade, progress reports can be sent back to School Loop. In Making the Grade, select Send Progress Reports from the School Loop drop-down menu. This will create a schoolloop.xml file that will be automatically be saved in your Making the Grade folder. Back on the portal page in School Loop, select Partner Gradebook in the Gradebook For... menu on the Navigation Bar. Browse to the schoolloop.xml file you just saved in the MTG folder and click Submit. Note: All progress reports will be uploaded to School Loop, published to student and parent homepages, and emailed home every night. 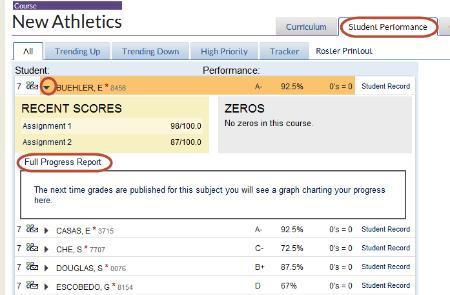 Once progress reports have been imported from Making The Grade, a convenient place to view them is from the Student Performance tab in the Course Tools. From the portal, click the Class Tools link. Click the Student Performance tab. Click the arrow next to a student's name to see details including a link to the Full Progress Report. The full progress report will contain the assignments and grades that have been imported for that student. Note: Only the most recently published progress report will be available for students and parents. School Loop does not keep a record of older progress reports or grades when using a partner gradebook. Therefore, remember to backup all gradebooks.